Need an instant wow? Cream puffs from the freezer case are the time-saving secret to this delicious dessert. Line cookie sheet with waxed paper. 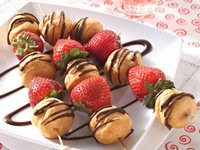 On each skewer, alternately thread 3 cream puffs and 2 strawberries. In small resealable freezer plastic bag, place chocolate chips and butter. Seal bag. Microwave on High about 30 seconds or until melted. Squeeze bag to mix melted chips and butter. Cut small tip from corner of bag. Drizzle chocolate mixture over kabobs. Place on cookie sheet. Refrigerate about 10 minutes or until set. Store in refrigerator. Calories 150 (Calories from Fat 90); Total Fat 10g (Saturated Fat 6g, Trans Fat 1/2g); Cholesterol 25mg; Sodium 20mg; Total Carbohydrate 13g (Dietary Fiber 1g, Sugars 11g); Protein 2g. Daily Values: Vitamin A 0%; Vitamin C 25%; Calcium 0%; Iron 0%. Exchanges: 1/2 Starch; 1/2 Other Carbohydrate; 0 Vegetable; 0 Medium-Fat Meat; 2 Fat. Carbohydrate Choices: 1. This entry was posted on 3:08 AM and is filed under Fruit . You can follow any responses to this entry through the RSS 2.0 feed. You can leave a response, or trackback from your own site.